Carole Cloutier (PhD in Applied Linguistics, Georgetown University). Prior to her employment at UMass, where she currently holds the position of Language Program Director (2009-present), Cloutier dedicated 7 years of her career as Assistant Professor of Spanish and Language Program Director at Ohio University (2002-2009), and 5 years directing the language program at Tulane University (1997-2002). In addition to the graduate Foreign Language Teaching Methodology course she currently teaches at UMass, she has taught a number of graduate courses at previous institutions, including: Assessing Spanish Proficiency in the Second Language Classroom, Approaches to the Teaching of Literature in the Second-Language Classroom, Introduction to Hispanic Linguistics, Individual Problems in Spanish Language, and Intercultural Understanding. 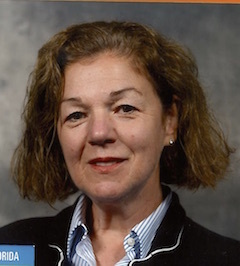 Additonally, Cloutier teaches five undergraduate courses at UMass: Phonetics, General View of Spanish Linguistics, Phonological Evolution from Latin to Spanish, Syntactic Structure of Spanish, and Intercultural Understanding. Cloutier has published three books (Análisis diacrónico de los cambios fonológicos del latín al español, Pearson, 2014; Introducción al análisis lingüístico — Sintaxis, fonología, dialectología y lingüística histórica, McGraw-Hill, 2007, and Curso de metodología — Teoría y práctica. Aprendizaje del español como segunda lengua, McGraw-Hill, 2005), as well as a collection of language-based activities (Activity File — Task-based Activities that promote meaningful interaction in the Spanish Second Language Classroom, Prentice Hall, 2004), and two sets of web-based materials in Más allá de las palabras: Intermediate Spanish, by Gallego & Godev, Wiley, 2004, and Mastering Intermediate Spanish, also by Gallego & Godev, Wiley, 2004. Professor Cloutier was awarded the ‘Outstanding Teaching Award’ for five consecutive years (Tulane University, 1997-2002), by the National College Senior Honor Society, as well as the ‘Distinguished Member of The National Society of Collegiate Scholars’ (Tulane University, 2002) in recognition for her outstanding contributions to the classroom, campus and community. In 2004, she was confered the Phi Beta Delta International Honor Society Medallion by the Ohio University Chapter, for demonstrated commitment to international study and activity and concern for issues of cultural communication. In 2006, she was the recipient of The Jeanette G. Grasselli Brown Faculty Teaching Award, in recognition of superior contributions to the instructional mission of the College of Arts and Sciences at Ohio University.